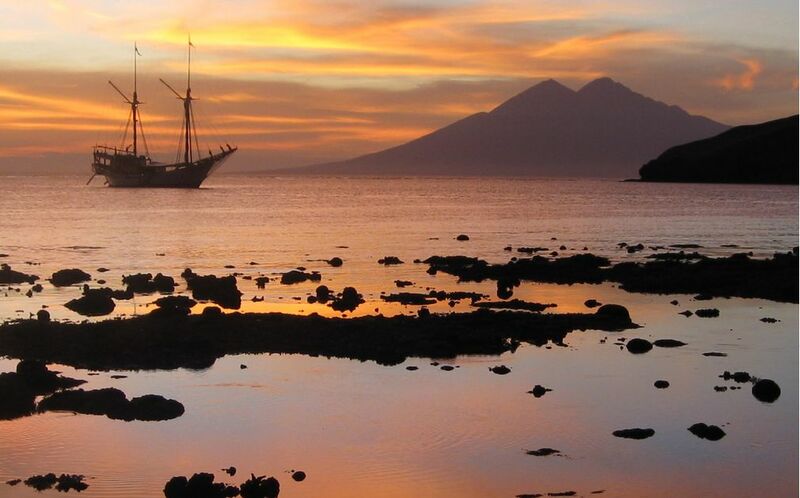 Exuding exotic adventures of Indonesian sailing boats travelling the historical Spice routes, seafaring on the Silolona is a luxurious nautical experience. 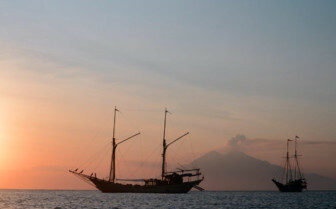 Available for private charters, the majestic Silolona is a reincarnation of an ancient Indonesian legend and made with the most spirited journeys in mind. 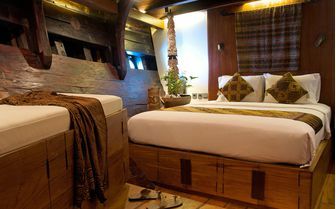 Hand-crafted from tropical hardwoods, the traditional phinisi sailing boat marries old world style and contemporary indulgences including a spacious deck, day beds and five air-conditioned suites. The Silolona is created for romantic voyaging with highly personalised service. 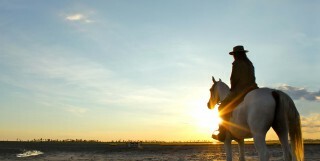 Depending on your preferences, we can arrange for a writer, expert naturalist or photographer to accompany you on your expedition. 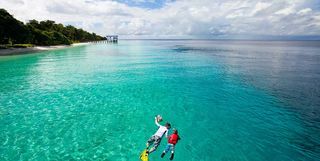 Roam Southeast Asia including Raja Ampat and Komodo, containing the largest biodiversity of pristine marine life on the planet, Thailand, the Andaman Islands and more. Navigate what feels like unchartered territory and on the spur-of-the-moment, anchor off a secluded beach for a party under the stars, tuck into a deluxe picnic atop hidden ruins or embark on snorkelling adventures in shallow lagoons. 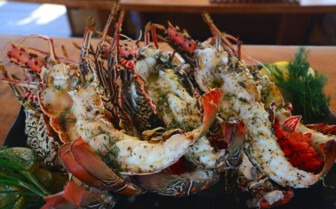 Culinary creations are a speciality on Silolona with personalised menus to satisfy even the most discerning foodies. Delight in Asian fusion cuisine alfresco on the boat's dining deck and enjoy sophisticated set-ups on remote beaches and in wild locations. 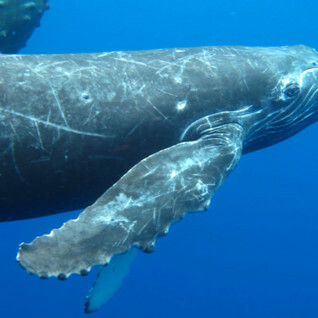 Head out to sea on tenders for aquatic excursions guided by the expert PADI dive instructor who knows the best secret dive spots on barely explored reefs thriving with wildlife. 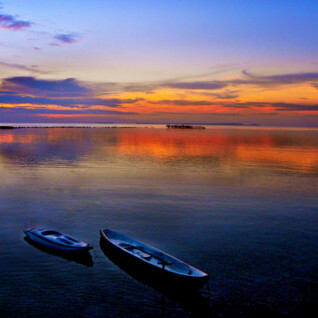 From water-skiing and wakeboarding to kayaking and sport fishing, navigate the sea at high speed or enjoy contemplative scenic exploration. 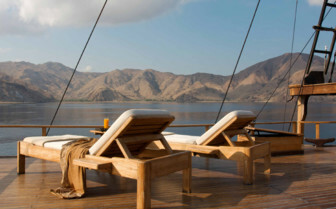 During downtime, Silolona offers a spa program tailor-made to suit your preferences where we can bring aboard specialists such as massage therapists and yoga instructors. 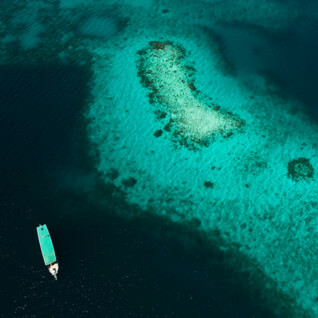 Si Datu Bua, Silolona’s sister boat, allows guests to experience some of the best diving spots on the planet, while experiencing fabulous hospitality and luxury onboard. 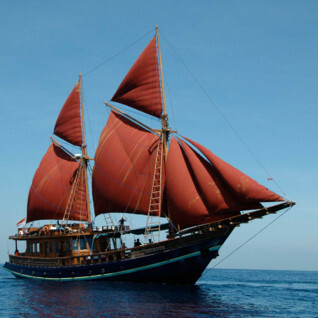 A beautifully crafted traditional Phinisi yacht, Tiger Blue is one of the fastest boats under power, and with luxurious teak fittings and billowing sails, the perfect way to explore the enthralling waters of the Indonesian Archipelago. 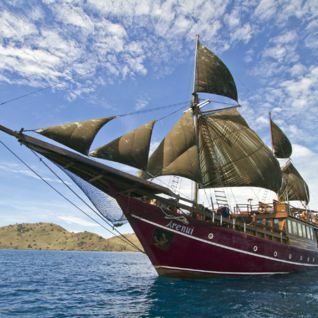 The Arenui liveaboard is a traditional Indonesian wooden vessel sailing the waters of Komodo, Maluku, Raja Ampat, Banda and beyond to provide incredible diving without sacrificing luxury or comfort. 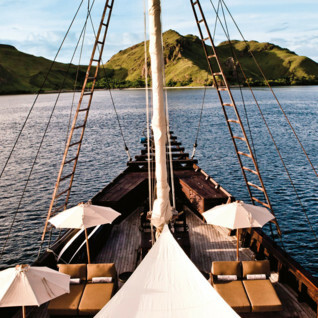 Combine a stay at Amanwana, with a Komodo Expedition. The Aman group are now offering this amazing adventure - from the incomparable and original Amanwana on Moyo Island to the dragon-infested islands of Komodo with their pristine reefs and sensational marine life staying on the Amanikan boat. 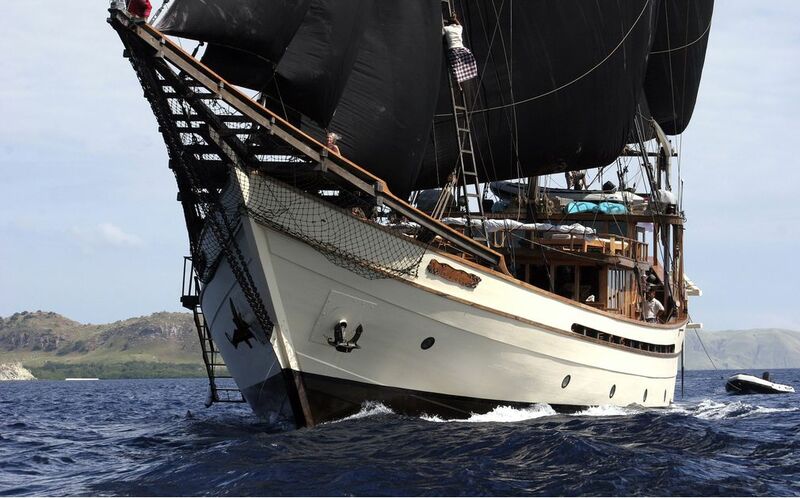 The Seven Seas is a 45-metre, traditionally built Indonesian sailing schooner built from the finest ironwood. 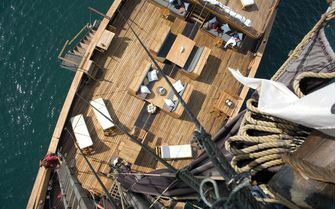 Custom-designed, she is perfectly suited for cruising, island hopping, diving and relaxation. Lembeh Resort provides the perfect place from which to explore the incredibly diverse marine life found in the Lembeh Strait of North-Eastern Sulawesi. 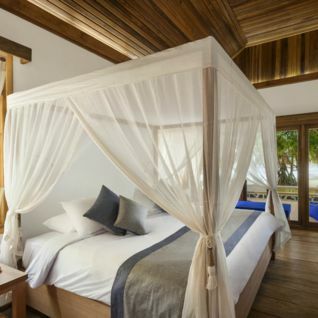 The Kura Kura Resort occupies its own 22 hectare island crowded with soaring royal palms and set amongst immaculately tended gardens crisscrossed with sandy paths. It is very peaceful with often the only sound being the calls of the exotic birds that call the island home. 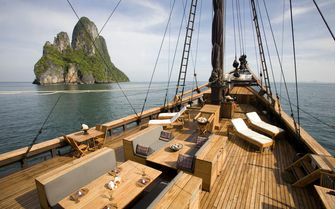 Explore the lesser known areas of the Indonesian Archipelago aboard a luxury liveaboard Phinisi ship, literal translation – super cool handcrafted wooden boat. 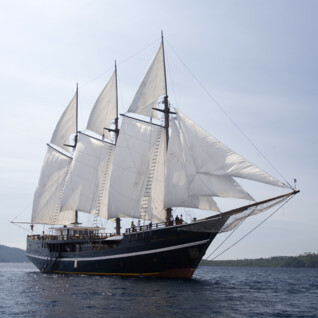 Alila Purnama, aside from being traditional in style, is right up there with other clean sailing counterparts. 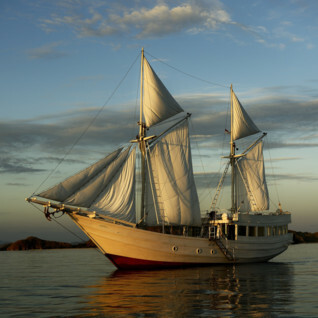 Sailing around the islands of eastern Indonesia, Alexa is a picture of grace and opulence. 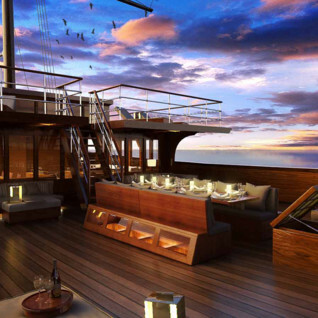 Designed for two, this romantic escape is one of the most exclusive yachting experiences on the planet. 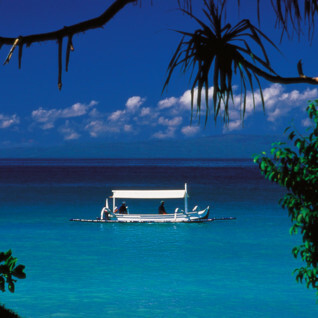 Based off the coast of Australia, True North offers some of the best opportunities for remote and unspoilt diving in Australia, Papua New Guinea and Indonesia. 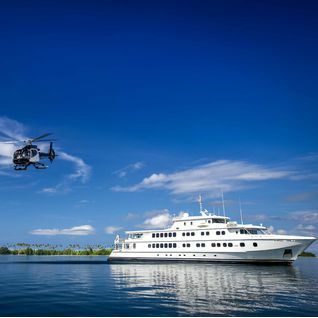 Though not a scuba diving focused boat, this luxurious ship is exceptionally well set up for divers and well-practised in finding the very best spots and sightings. 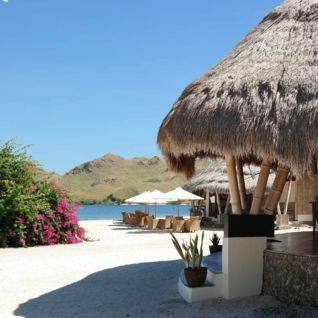 Komodo Dive Resort sits on the shores of Sebayur Island and is the brain child of two avid divers, Antonello and Stefano. 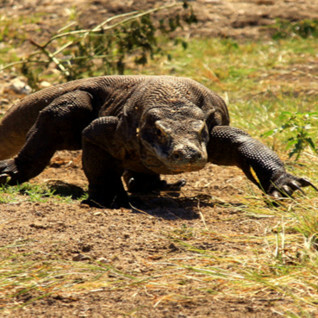 After visiting Komodo and Indonesia on regular business trips the pair decided to buy the Island in 2009 and thereafter began building the environmentally friendly hideout. 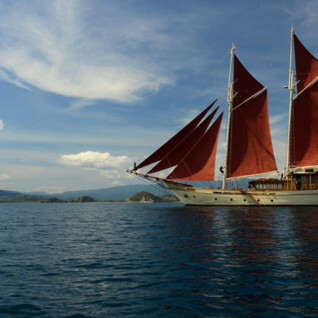 Dive Damai’s newest vessel, the My Damai II, was built in 2011 by Pak Hadji Baso a highly respected traditional Indonesian boat builder. With a deck length of 40 metres and a beam of 9 meters (at its widest point) the Damai II is a spacious vessel perfect for an exhilarating ocean adventure. 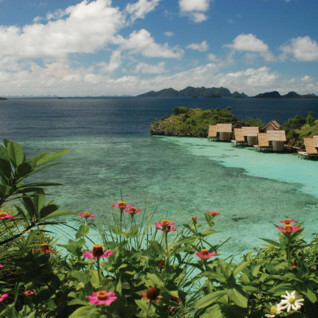 In the heart of Indonesia, in one of the most exciting new diving spots on the planet, Kalimaya Dive Resort is offering guests a rare combination of luxury and dedicated diving focus. 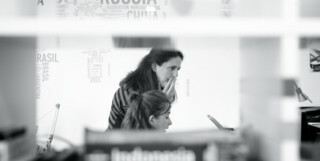 In fact, the whole resort was design with divers specifically in mind, so you know you’ll be in good hands here. 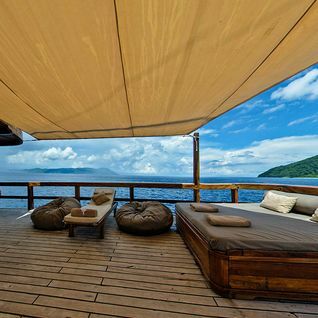 Alami Alor Dive Resort is an intimate hotel set in a beautiful marine environment. 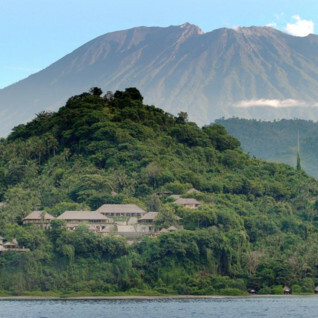 Built into a cliff on the relatively unknown east coast of Bali, Amankila (meaning “peaceful hill”), overlooks the serene waters of the Lombok Strait against a dramatic backdrop of Mount Agung. 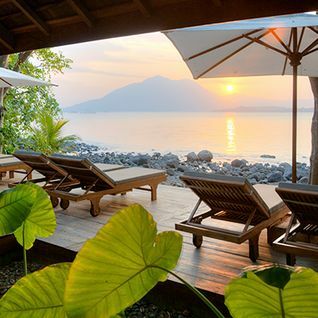 A secluded, charming boutique hotel located on the east coast of Bali, Alila Manggis is nestled in a coconut grove between the sea and the towering Mount Agung. All rooms feature a private shaded terrace with garden or ocean views, sunken marble garden baths and butler service, while some also have private swimming pools. 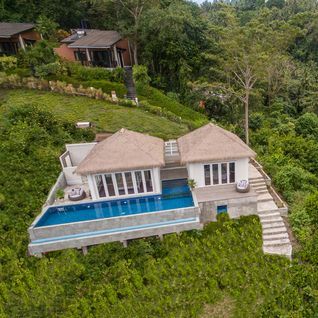 Escaping the tourist track, The Menjangan is a peaceful luxury retreat located on the boundary of Bali Barat National Park – set just away from some of the island’s best diving. 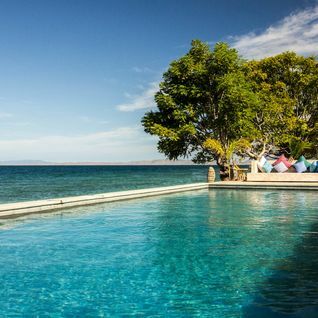 A two hour boat journey from the town of Sorong takes you to the remote Sorido Bay Resort, one of the pioneering resorts in this part of the world and the very best place from which to dive some of the world’s best dive sites. Misool Eco Resort is in one of the most beautifully remote places we have ever been. 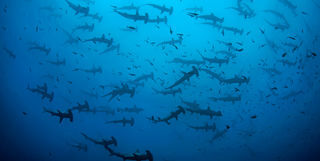 The diving, and the place, are very special. 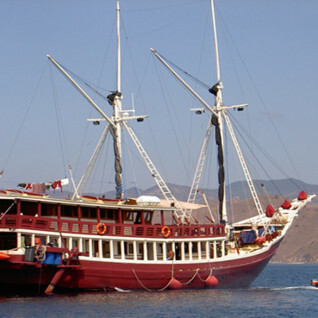 Dewi Nusantara is one of a handful of great quality boats operating in the top diving locations in Indonesia. It doesn't get much better. 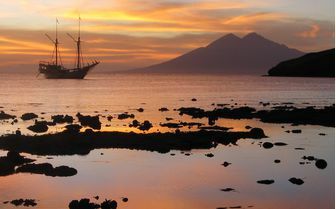 Amandira fuses the Sanskrit words for ‘peace’ and ‘intrepid’, and this is exactly what she offers guests – the chance to become an intrepid explorer, diving some of the Indonesian archipelago’s most remote reefs, without foregoing the comfort of a luxury hotel. Occupying a 24 hectare island the Siladen Dive Resort sits on a very good white sand beach, a real rarity in this part of Indonesia where the majority of the beaches are black. 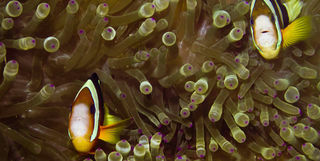 The Wakatobi Dive Resort is something of an enigma, straddling the divide between luxury dive resort and boutique hotel. The atmosphere is incredibly relaxed, the local staff ever helpful, and given where you are it is an amazing achievement, the more so as it puts so much back into the local community. 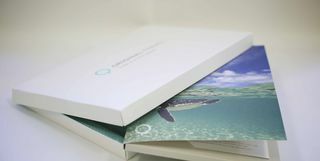 Without the hotel’s existence, it is frighteningly credible that the reefs would by now have been dynamited to extinction. The boutique-style Pelagian liveaboard offers an extremely comfortable way to explore Wakatobi and the surrounding waters and with a maximum of 10 guests onboard, a very personal experience. 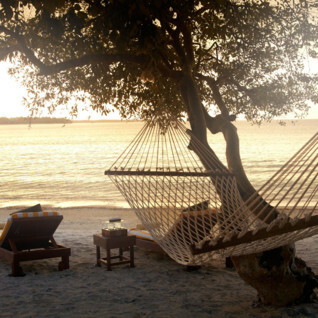 Perhaps best described as a five-star nature camp, Amanwana is part of the exclusive Aman group of hotels and is set on the nature reserve of Moyo Island, just to the east of Bali, in Indonesia. 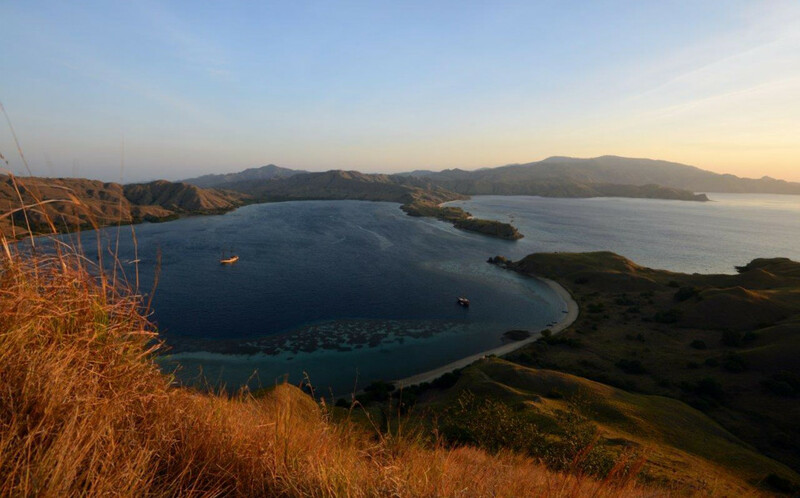 Neill and Louisa are our Indonesia experts and as seasoned travellers they have the inside track on the most memorable adventures.